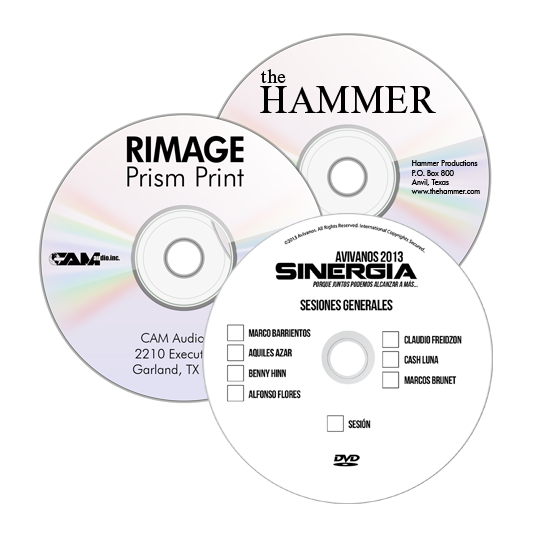 If you’re looking for high quality & great looking printed discs, let us print for you. We can duplicate them or leave them blank, it’s up to you. Either way they’ll look great and the turnaround time is fast. 1-2 days in most cases. Please contact the duplication department with any questions regarding our printing & duplication services. (972) 271-2800 or duplication@camaudio.com. The Prism print is the best choice when all you want is great looking text and logos. Simple and professional, this print is usually done on shiny silver thermal media, but can be printed on white thermal media as well. It’s our fastest print and provides the quickest turnaround time. Prism CD's as low as $0.65 ea. Prism DVD's as low as $0.80 ea. Doing your own printing? Purchase silver thermal media online. Minimum coverage inkjet can be used when you want just a small amount of color to make your prints stand out. 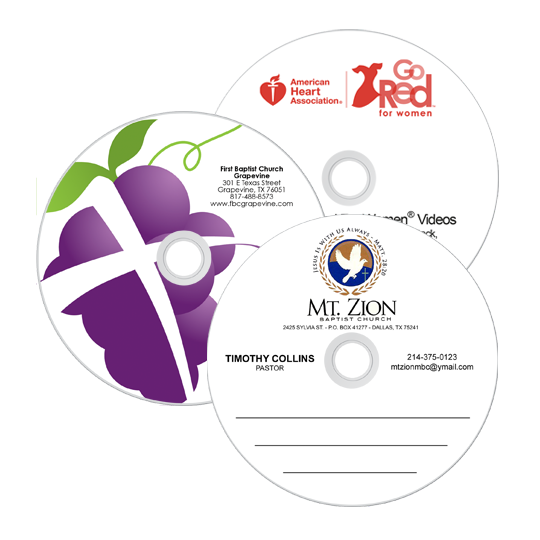 Ink coverage is limited to a minimum part of the disc surface such as logos, text, or pictures. White or silver inkjet media can be used. Water-resistant media is also available. Inkjet CD's as low as $0.75 ea. Inkjet DVD's as low as $0.90 ea. Doing your own printing? Purchase inkjet media online. The same Rimage Everest 600 print quality in a monochromatic look. This glossy print works great for black and white designs. It also comes at a slightly lower cost than the color thermal print. For a slightly higher cost, monochrome images can be printed on our Everest silver thermal media which adds a shiny, chrome look to your printed disc. Everest CD's as low as $0.80 ea. Everest DVD's as low as $0.95 ea. Doing your own printing? 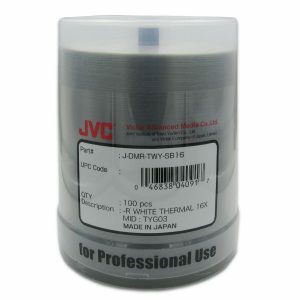 Purchase white thermal media online. By far our most popular print. When you want a high quality, smudge free, full color print, look no further. The Rimage Everest 600 printer gives you a professional, glossy print that you can be proud of. 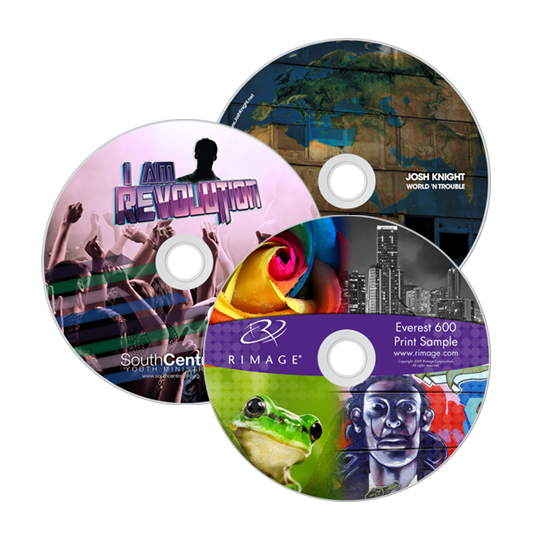 For a slightly higher cost, full color and monochrome images can be printed on our Everest silver thermal media which adds a shiny, chrome look to your printed disc. 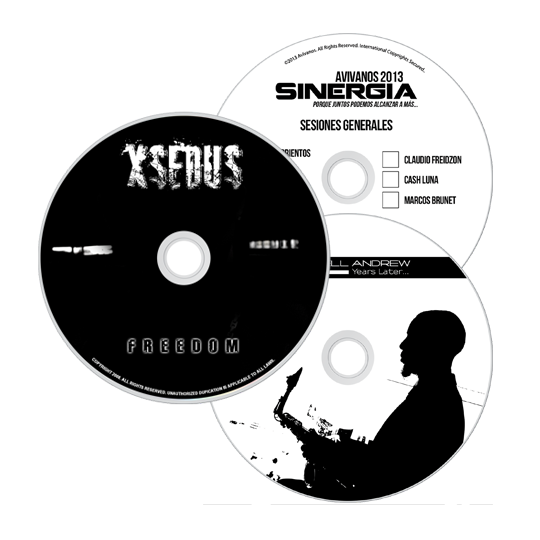 Everest CD duplication as low as $0.90 ea. Everest DVD duplication as low as $1.05 ea. Replication services are also available for larger quantities of at least 1,000. 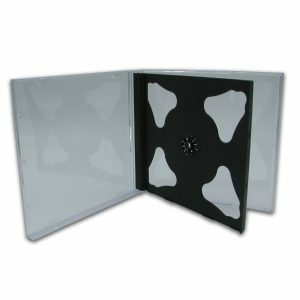 Discs can be done in bulk or you can choose from a variety of packaging options.